I’ve been making these cookies for Christmas since 1994. Beat margarine in a large bowl with an electric mixer on medium speed for 30 seconds. Add sugar and beat till fluffy. Add egg, vanilla, nutmeg, and extract; beat well. Add half of the flour. Beat at low speed just till combined. Stir in remaining flour. Roll dough on a lightly floured surface to just over 1/8-inch. Cut into 3×3/4-inch logs. (I use a crimping wheel to cut them.) Place 1 inch apart on an ungreased cookie sheet, or line the cookie sheet with parchment paper. 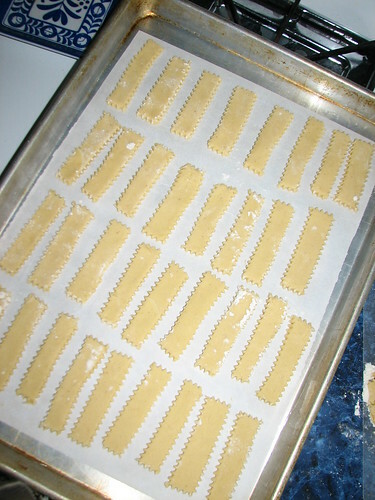 Bake in a 350* oven for 15 minutes or till bottoms are lightly browned. Transfer to a wire rack; cool completely. Drizzle cookies with powdered sugar glaze (powdered sugar mixed with a little water or milk) or melted candy coating (vanilla or chocolate). Or dip one or both ends into candy coating. 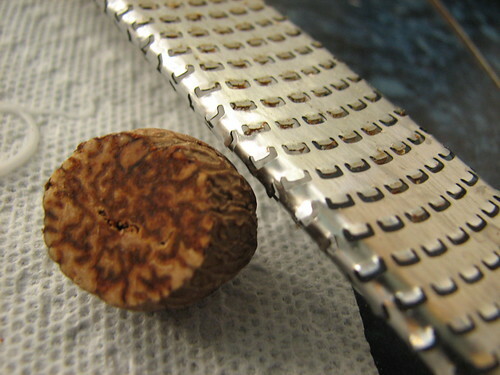 Garnish with freshly grated nutmeg while coating is still soft. Makes about 85. Freezes very well. If you don’t like them thin and on the crisp side, just roll them a little thicker, up to 1/4″. They will take a bit longer to bake and you won’t get as many, but they will be softer. I use freshly grated nutmeg in this recipe. Actually, I grate nutmeg for all recipes calling for nutmeg. It has a much better flavor than ground nutmeg from a jar or can. I cut the amount down a bit, as it is a stronger flavor. 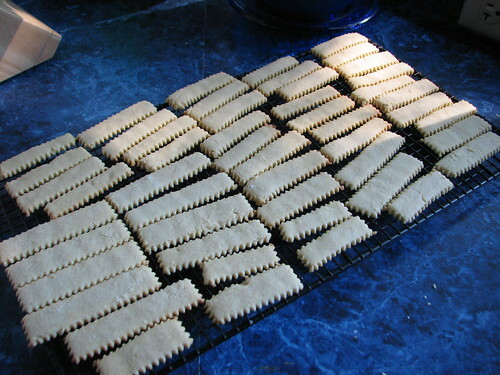 Nutmeg Logs is the first cookie recipe I make each year for Christmas. They will be stored in the freezer for our annual open house. I like to use the pastry wheel to cut the cookies. It gives them a decorative edge. The Nutmeg Logs can be placed close together as they do not spread. I roll them thinner than the recipe originally called for. 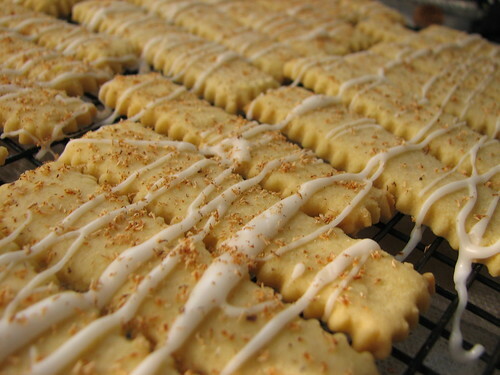 Drizzled with powdered sugar glaze and dusted with grated nutmeg. When the glaze is dry, I’ll layer them between waxed paper in a plastic container and store them in the freezer. 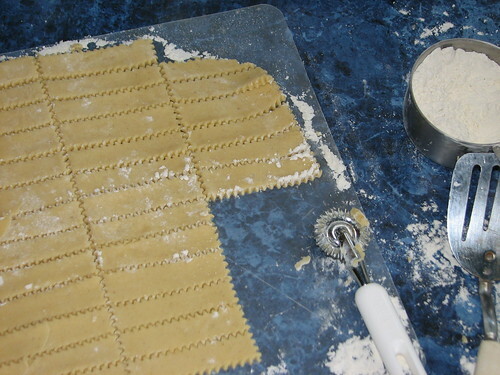 One recipe down…20 or so to go. 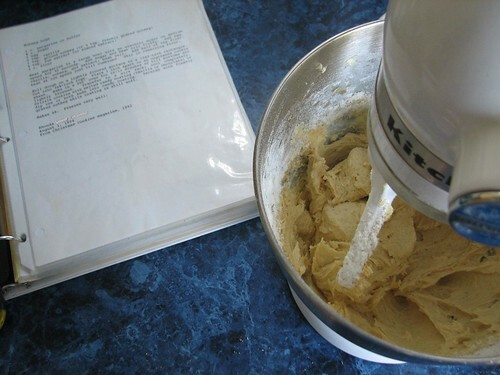 This entry was written by ~~Rhonda, posted on October 16, 2008 at 3:30 pm, filed under cookies and tagged cookies, nutmeg logs, recipe. Bookmark the permalink. Follow any comments here with the RSS feed for this post. Post a comment or leave a trackback: Trackback URL. Do you know where i can find one of those pasta rollers like the one you used?I looked at walmart and didn’t see them there.I have been wanting to get one for awhile. By the way,I made a batch of this dough and the elfin bites dough.Its in the refrigerator chilling now.Can’t wait to try them! Hilary, I can’t remember where I purchased my pastry wheel, but it was probably Wal-Mart. I’ve had it for ages. There are several on amazon.com. Here’s one similar to the one I use. It’s sometimes called a crimping wheel or a crimper pastry wheel. I used igoogle translator…hope you can understand it! Tais, sim, eu congelar os logs com o esmalte sobre eles. Ele funciona muito bem. Eu espero que você vai dar-lhes uma tentativa!